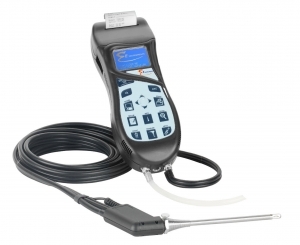 The new E1100 Hand-Held Combustion Analyser is a rugged unit for boiler, burner, engine, turbine, furnace, and other combustion applications. It is available from E Instruments International. Pre-calibrated and field replaceable sensors allow for easy diagnostics and replacements to reduce down-time and costly repair charges. * O2 (0-25 per cent) and CO (0-8000 ppm) Sensors. * Efficiency, Excess Air, and CO2 per centage Calculated Values. * Stack Gas and Ambient Air Temperature Measurements. * Draft & Differential Pressure Measurements. * 12-in Probe with 10-in Dual Hose and Optional Hose Extensions. * Rechargeable Battery and AC Charger. * Internal Memory (900 tests) to Save Data. * Software Package with USB Communications Cable. * Vinyl Carrying Case with Shoulder Strap.